Tags: 2013 WSOPE, Erik Seidel, Roger Hairabedian. Posted on Monday, October 21, 2013 by "T". On Friday, the final table of Event #5: €2,200 No Limit Hold'em began with 7 players and Erik Seidel was the chip leader. The American poker legend was looking to win his 9th WSOP bracelet and got the best possible start as he eliminated Max Greenword and Mike Watson within the first 15 hands. Seidel four-bet all in with 6 6 and Hairabedian called with A Q . The flop rolled out A 8 J . The 10 on the river was to no help for Mr. Seidel, but luckily the 6 spiked the river to give him a set. Suddenly, out of nowhere, Seidel was back in the chip lead with three remaining players. Seidel called a four-bet shove from Hairabedian with 8 8 , but he needed to get lucky on the board as the Frenchman turned over K K . The flop of 6 5 9 and gave Seidel a gutshot draw as well, but the turn and river bricked J and 2 and the match was over. This was the third time Erik Seidel finished runner-up in a bracelet in his career. 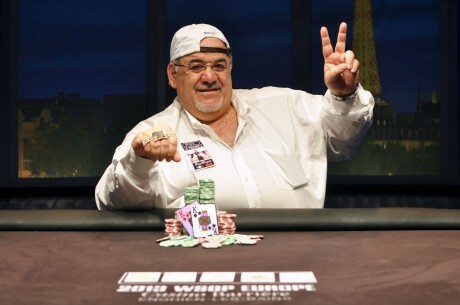 Roger Hairabedian became the first player in WSOPE history to win multiple bracelets and he's the only player of the 13 French bracelet winners to have more than one bracelet! Hairabedian now has over $4.4 million in tournament earnings and is ranked third on the country's all-time money list. 2 comments for "2013 WSOPE: Roger Hairabedian Defeats Erik Seidel Heads Up In Event #5"
Close but no cigar for Seidel, looks like he was lucky to even be in with a chance after that 6 on the river. Not sure I understand his 4bet shove with only 88 - surely the other guy is holding a big hand probably better than a mid pock pair. I cannot question him, he's Seidel..